Phenolic compounds are the most abundant natural antioxidants in our diet. Epidemiological studies have shown the possible prevention effects of consumption of fruits and vegetables rich in phenolic compounds on degenerative diseases, such as cardiovascular diseases and cancers. However, there is a serious lack of fundamental knowledge on the uptake and metabolism of phenolic compounds in humans. It is clear that phenolic molecules, only absorbed by humans, can exert biological effects. This review presents a current knowledge on the analytical methods, antioxidant capacity measurements, as well as research strategies related to natural phenolic antioxidants on human health. Both GC-MS and LC-MS have proved to be very useful analytical techniques that can be employed to identify and quantitate targeted phenolic antioxidants and their metabolites in biofluids. Free radical quenching tests provide a direct measurement of antioxidant capacity but lack specificity and may oversimplify the in vivo human physiological environment. Research strategies are diverse and mainly focused on positive health effect of antioxidants. In the future studies, multiple potential bioactivities, both positive and negative, should be considered. ZUO, YUEGANG; ZHANG, KAI. Natural Phenolic Antioxidants in Human Fluids: Analytical Approaches and Antioxidant Capacity Studies. Pakistan Journal of Analytical & Environmental Chemistry, [S.l. ], v. 7, n. 1, p. 9, dec. 2006. ISSN 2221-5255. Available at: <http://pjaec.pk/index.php/pjaec/article/view/161>. Date accessed: 21 apr. 2019. The work is original and has not been previously published (except in the form of an abstract or a part of a published lecture, review or thesis). If accepted for publication, it will NOT be published commercially elsewhere in the same form, in any language, without the consent of Editor or Publisher. 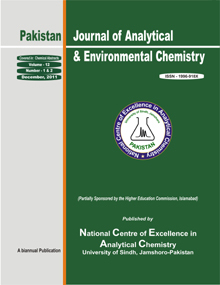 Pakistan Journal of Analytical & Environmental Chemistry is published biannually by the National Centre of Excellence in Analytical Chemistry, Jamshoro, Sindh - PAKISTAN.